Bold, imposing and radical, the new 'Merchant Navy' class - initially constructed while the Country was still embroiled in the war years - brought Southern Railway locomotives into the modern age. The air-smoothed casing - a new direction for Southern Railway motive power - tied in perfectly with the clean 'Art Deco' styling of many Southern stations. 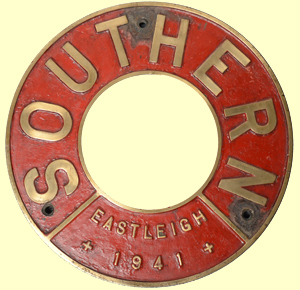 From a time when travelling by train was still the norm, the Southern gained much prestige with titled trains like the 'Atlantic Coast Express', promoting holiday journeys from London to the South-West's sunny sandy beaches; - and the locomotive hauling the train - possibly one of the 30 powerful 'Merchant Navy' class locomotives. Fresh from working with Nigel Gresley on the L.N.E.R. pacifics, Bulleid - as new Southern C.M.E. - was keen to develop fresh ideas. Although the design for these express locos was approved in 1938, production was held back as railway workshops were busy supporting the War effort. Somehow persuading management that these were 'mixed traffic' locomotives, and despite being advanced and complex they were introduced in 1941, though not without problems. For it's day the enclosed cab of the new 'Merchant Navy' class was very comfortable, and well laid out for the driver and fireman. This included a steam operated fire-hole door, and turbine powered electric lighting for the headlamps, cabs, controls, and even under the casing; and the valve gear was encased in a sealed oil bath reducing the amount of oiling around that had to be done by the crew prior to a journey. Though prone to slipping when starting, these powerful locomotives also gave a very smooth ride, and complementing the locomotives was new Bulleid designed passenger coaching stock. The locos were introduced in matt finish Malachite green, with broad yellow lines, a matt black roof, and distinctive name and number plates made from brass castings with a red painted background. Two variations of experimental blue were also tried, but Wartime black livery did this class no favours, giving them a very slug like appearance. Early locomotives suffered from bad visibility as the low chimney and smooth casing allowed exhaust smoke to cling to the body, obscuring the drivers vision. This soon led to a redesign including smoke deflectors to lift the smoke clear. Later, as the valve gear began to wear, valve timing became erractic; but due to the enclosed motion, identifying and fixing even small problems was a big job. Also oil leaked out, leading to occasional fires, and additional wheel slipping. None of these locomotives survive in their original condition. The entire class was substantially rebuilt by British Railways from 1956, during which they lost their distinctive casing, and the chain driven valve gear with oil bath; please see the separate article on the rebuilt version. However, some members did survive beyond the end of the British Railways steam era into preservation, with several still running today. To model this prototype is a real challenge. Whilst the air-smoothed casing and hidden valve gear could allow compromises, to be authentic and build three cylinders with chain driven Walshaerts valve gear in miniature requires a massive determination. Certainly an ambitious model to undertake, particularly as there are few serialised or commercial scaled plans available. But it has been tackled, and a number of owners have contributed articles to this site on their own versions of these intriguing locomotives. Please hover your mouse over the photos for a description, or press pause to hold the photo.